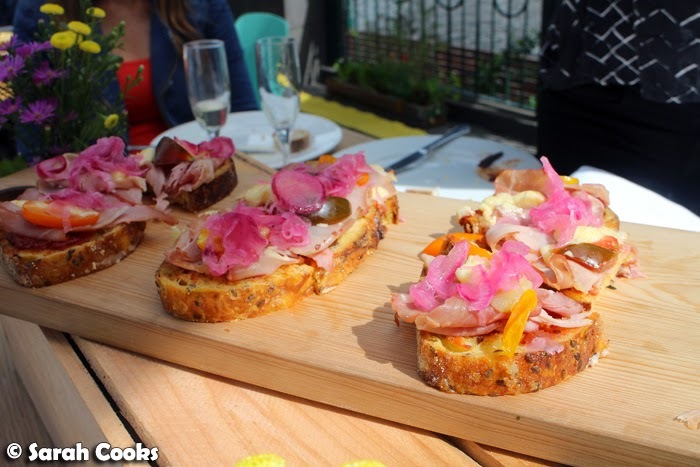 There are few things that will get me out of bed early on a Sunday - but when I received an invitation to a Sparkling Bloggers Brunch at the Melbourne Food and Wine Festival Artisan Bakery and Bar, catered by Peter Rowland Catering, I was totally there! 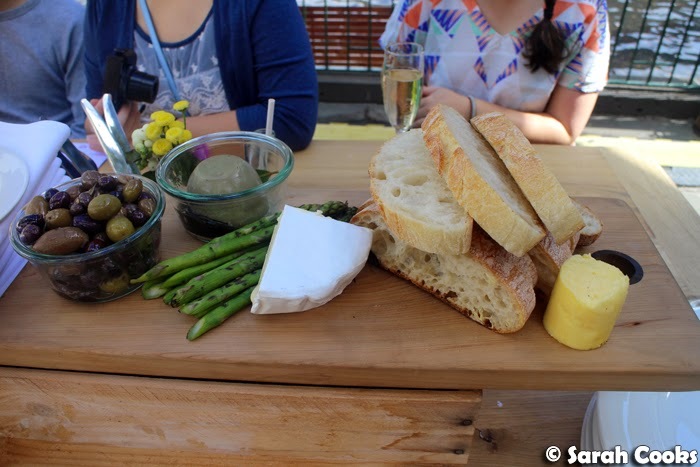 Sparkling wine, coffee, and freshly baked bread? Did we just become best friends?! 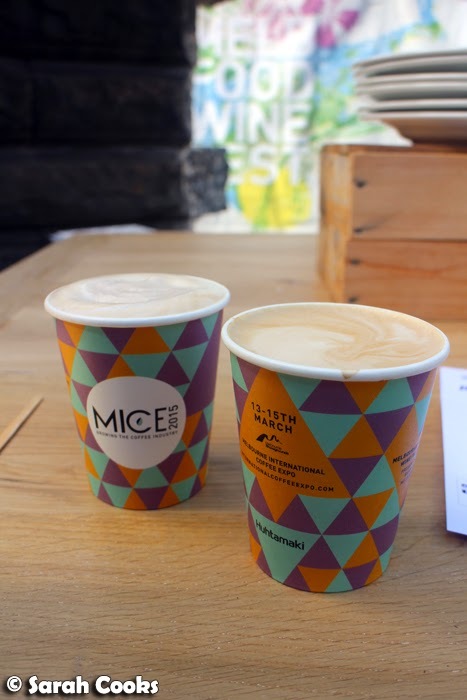 The Festival Artisan Bakery and Bar is a pop-up located on Queensbridge Square that will be running for the duration of the MFWF (until 15 March), with a rotating selection of local and international bakers, selling breads and other baked goods to enjoy there or take away. 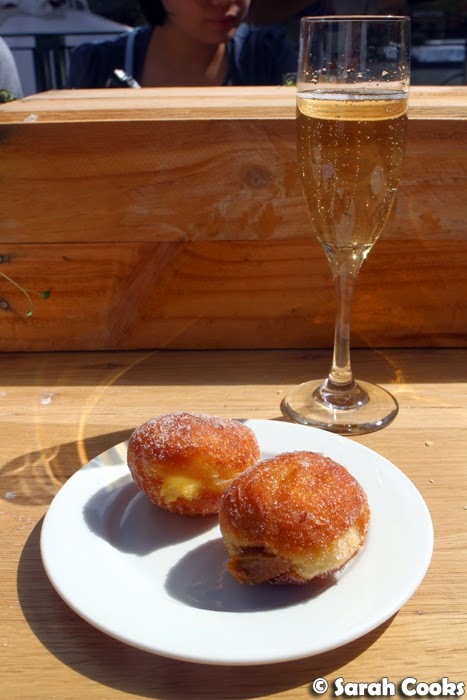 You can check out the MFWF website for the roster of bakers and coffee makers - I'm most excited about Baker D Chirico, Tivoli Road Bakery and Eric Kayser! 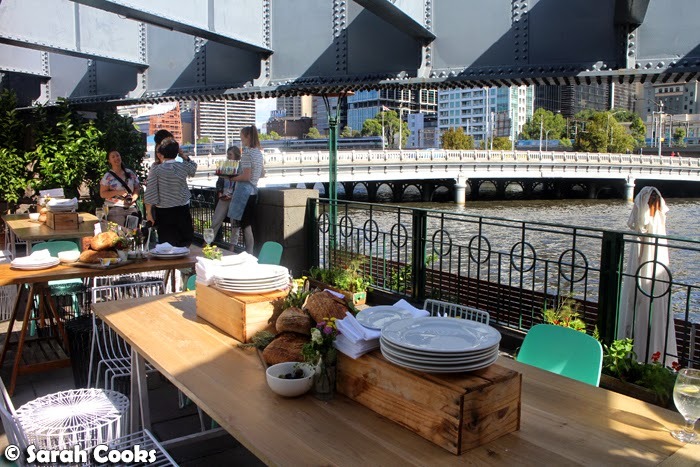 Our bloggers brunch was located right on the river - it was a great spot, and luckily the weather held up! 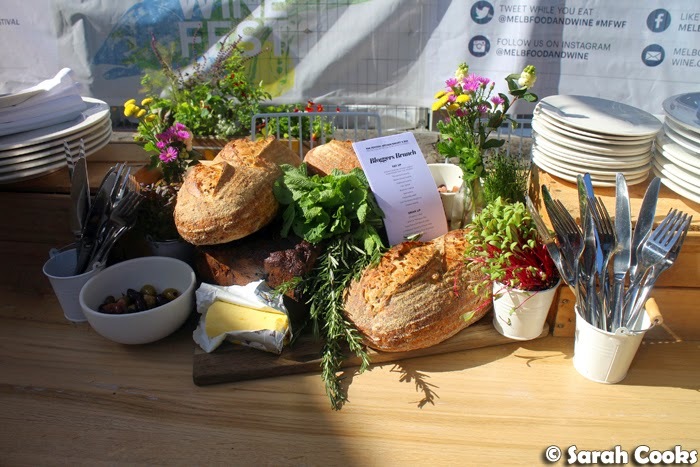 The brunch we enjoyed that morning was produced by Peter Rowland Catering, featuring bread from the Festival Bakery's bakers in residence Irrewarra Sourdough and Woodfrog Bakery. 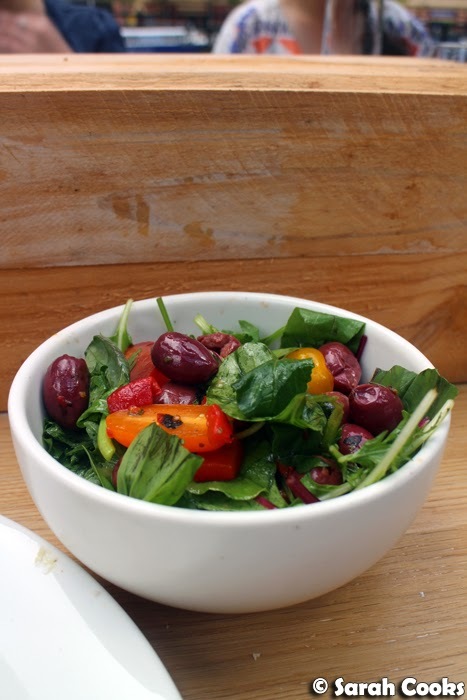 There was some serious carb-loading going on! 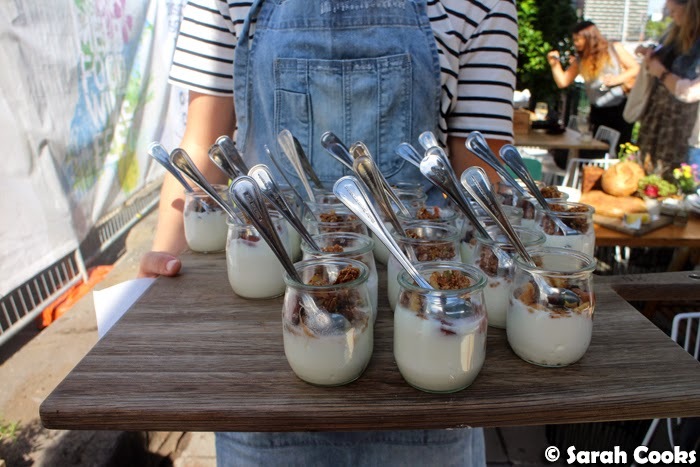 We started off with some yogurt pots, with Irrewarra granola and rhubarb compote. The granola reminded me of one of my favourite recipes: Andy's Fairfield Granola, from Nigella's book Feast - big crunchy clusters of oats, almonds, walnuts and dried fruit with spices. Delicious. 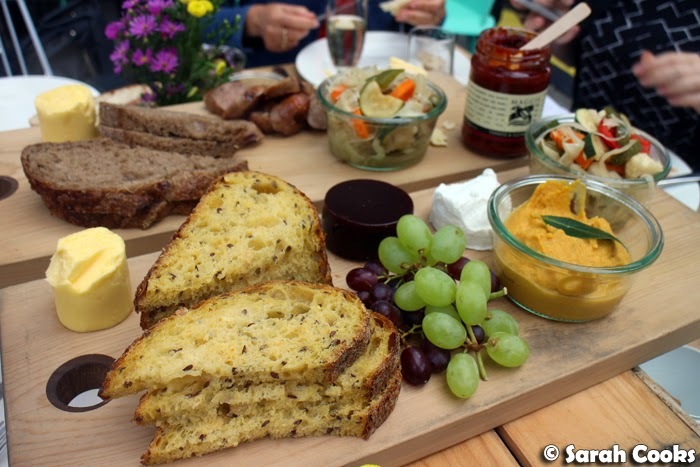 We really got stuck into the bread with three different boards (Ploughman's, Mediterranean, and Vegetarian), featuring pickles, chutneys, meats, dips, olives, pâté, cheeses, and the highlight for me: batons of soft salted Myrtleford butter. 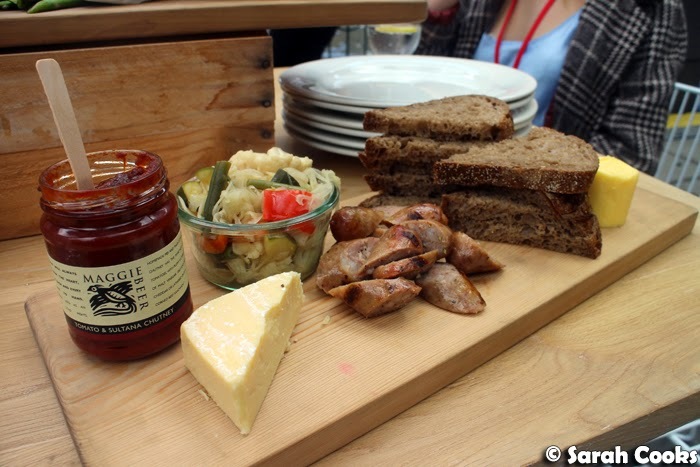 Next up were some tartines: thick slices of bread with hot toppings. 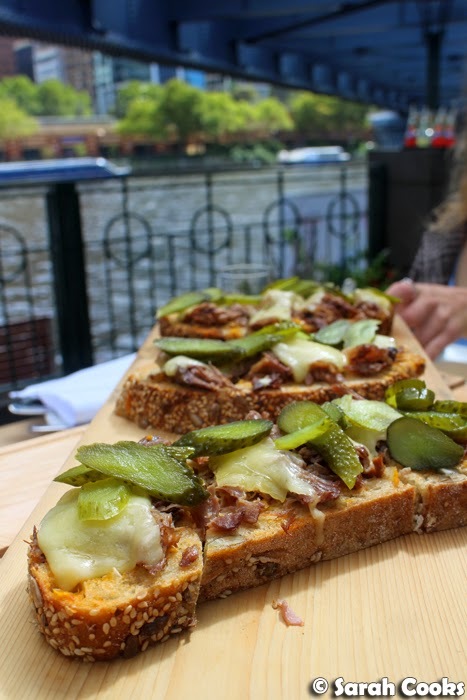 My favourite was the beef tartine, with slow-cooked beef, melted cheese, and pickles. 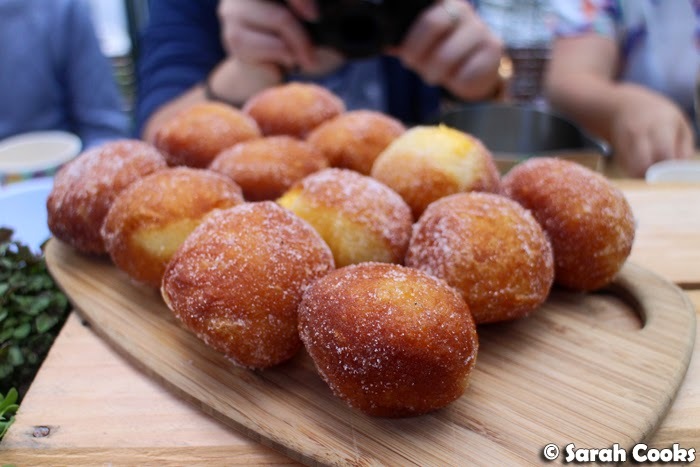 Then came out the star of the show... Tivoli Road Bakery donuts - lemon curd and salted caramel. Out came a swarm of smartphones and cameras! The donuts were just as good as I remembered them from my last visit to Tivoli Road Bakery three years ago - I loved the generous amount of thick salted caramel filling and the super light donut dough. I thought we were all done, but then they brought out cheese platters! 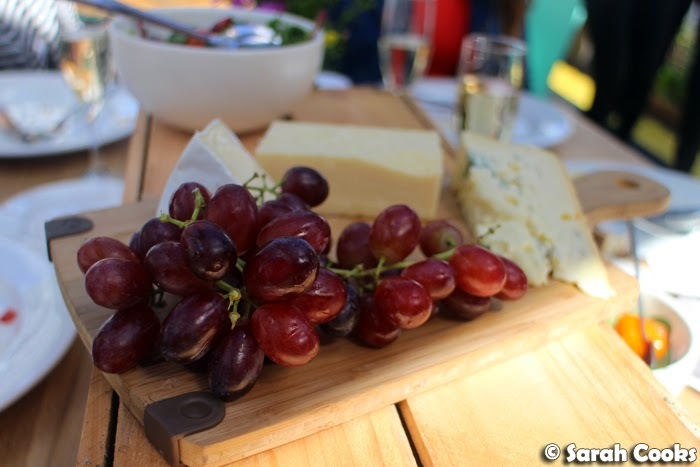 You know me, normally I'd totally be going to town on a cheese platter, but we'd already eaten so much that I didn't even take a bite. 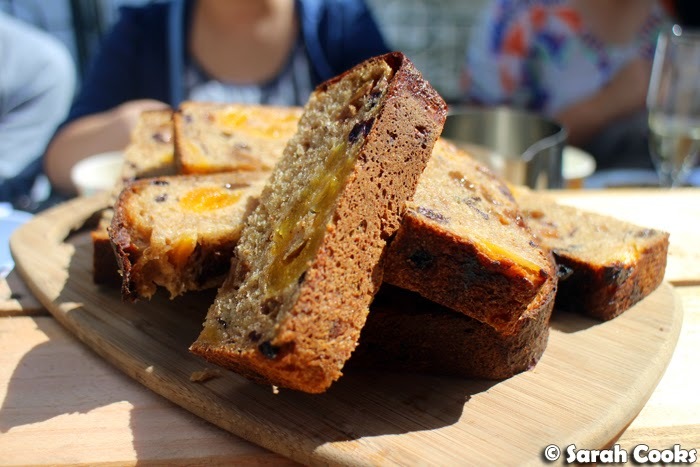 But then... they brought out this incredible fruit loaf from Irrewarra Sourdough, and I just had to try some. It was really soft, with heaps of moist fruit inside, and a spicy flavour, almost like Christmas cake. Love! Just quietly, I liked the fruit loaf even more than the donuts! We were encouraged to take the loaves from the centrepieces home with us, so I happily snatched up one of these fruit loves and ate slices of it for breakfast throughout the week, heavily slathered in Pepe Saya butter. (I couldn't find Myrtleford butter at my local gourmet supermarket, but Pepe Saya was a worthy substitute!) Heaven. 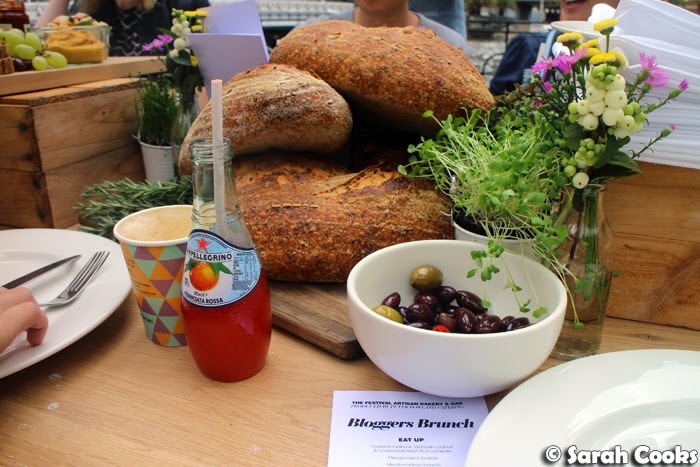 We had a great morning at the Bloggers Brunch, and I'm hoping to pop down to the Festival Bakery again this week to stock up on more bread and baked treats. For me, too much bread is never enough! 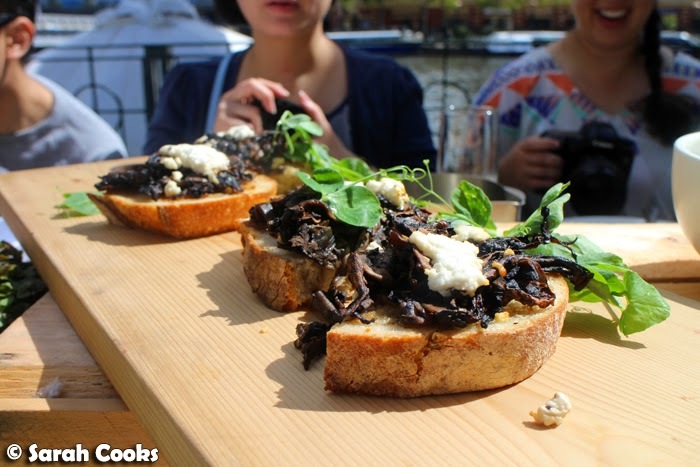 Sarah and Sandra attended the Bloggers Brunch at the MFWF Artisan Bakery and Bar as guests. 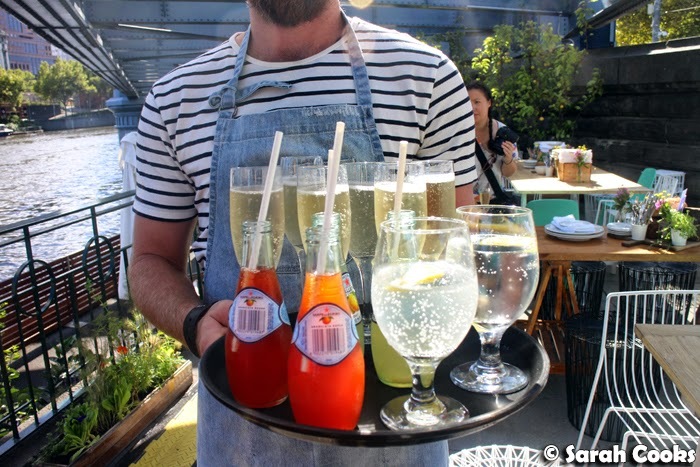 I don't even know what it would be like to live a life where Pepe Saya is the second choice. What a dream. You know I saw those donuts and thought "oh yeah hurt me!!" :P They look really good! So sad to miss this - it looked amazing. 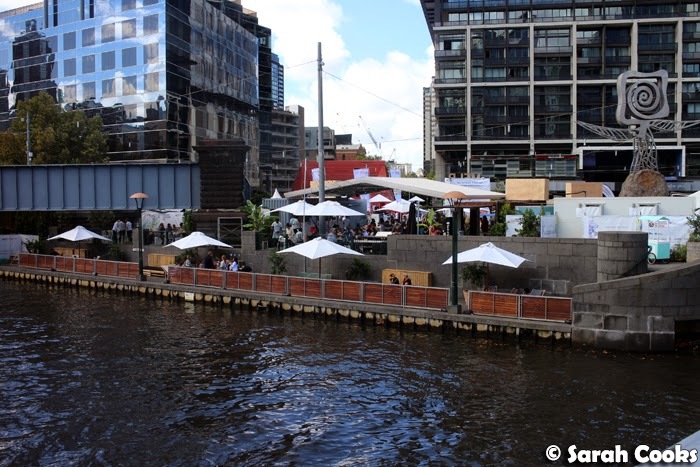 Love the pop up though - such a great hub for the MFWF.